Arizona State University is ranked among the top producers of student entrepreneurs and Fulbright Scholars in the United States. The university strives towards excellence in the fields of research and discovery. ASU has one of the most highly-regarded university bookstores with access to the latest and greatest educational materials to help the university achieve excellence in the academic research field. With access to hundreds of different textbooks for the nearly 250 academic undergraduate programs and forward-thinking graduate programs, the campus store offers the option of one stop campus service or online inventory. Either way, the bookstore provides quick and easy access to the materials faculty and students alike will need to further their education. 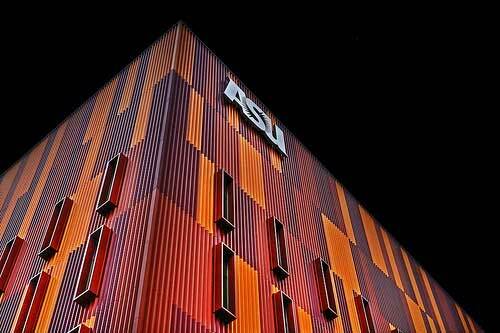 Staying ahead of the curve is also part of the appeal of the ASU academic programs. For the financially and technically inclined students at Arizone State, CafeScribe provides the latest and greatest technology for using etextbooks. Created by the Follett Higher Education Group, the same group that is behind the very popular eFollett ecommerce website for bookstores, CafeScribe costs up to 40-60% less than the cost of physical textbooks and can be downloaded straight to your home or personal computer. ASU students can now share notes with their classmates and discuss reading materials online with their professors and peers. The Sun Devils Campus Store is helping many ASU students say goodbye to heavy, cumbersome textbooks by providing them with affordable, digital options. The digital options available to students will rapidly grow over the coming years. As more textbook-related technology companies begin competing to provide digital learning options, such as new platforms for collaborative online textbooks and online classes, students should hopefully benefit from this competition through lower overall learning costs. Officially opening its doors on April Fool’s Day, 1974, Changing Hands was built on the idea of bringing educational and varietal reading materials to the local community. To this day, they still offer a continuously shifting mix of new, used, and sale books of all kind. Unlike some bookstores which offer only a fraction of retail price, Changing Hands offers 50% of the total resale value for quality texts. If you find yourself among many millions turning towards e-books these days, Changing Hands can be there too. Find access to their Google e-book library on any smartphone or tablet product, and most e-readers including Nook Color, Kindle Fire, Sony Reader, and many more. The app is free for Android and iOS, setting up a Google eBooks account is free, and the e-books are priced the same as Amazon.com and Barnes and Noble. For information about the ASU Bookstore, including reviews from ASU students, potential information regarding availability of etextbooks or textbook rentals, and driving directions, visit the ASU Bookstore Google Places page. Check out the ASU Bookstore on Twitter for more textbook news and discounts. Check Out the ASU Bookstore on Foursquare for updated student feedback.